The Radio program dealt with "Men, who do we think they are"
The show was apparently inspired by me and built around a conversation I had with a Freelance Journalist / Photographer whilst at the Cobargo Folk Music Festival in New South Wales. How an unexpected encounter with a gentle man at the Cobargo Folk Festival encouraged me to contribute to ABC Open’s Portrait of a Stranger project. I went to the 2011 Cobargo Folk Festival knowing that untold pleasures awaited me. Camp sites, a line of stalls selling everything from food and clothing to jewellry, hula hoops, hemp oils, tattoos and massage. Teenagers strolling around, and younger buskers blowing on a recorder or banging a drum. Mix in 1 million black crickets encircling the street lamp forming photographic pictures of beauty. Then add more crickets, up the walls, up your trouser leg, in your hair, down your back or singing all night forcing you to cry out “SHUT UP”. A mountain climb, designed to take everybody to another fitness level, leads to the showers and toilets, a jolly place where ladies form new friendships or meet up with others whom they haven’t seen since last festival. Morris Dancers, workshops, an open mike…the beauty of the lady under an iridescent pink umbrella, sitting in a green paddock 50 metres from the venue because the music sounded “just right” at that distance. The belly dancers looking right at me. Not a bad idea to concentrate on the grandmotherly type in the front row, nevertheless, there is something disconcerting about meeting the flashing eyes of a scantily clad shimmering woman! I spied the man between the racks of ladies’ dresses, my attention caught by the vision of him holding up a creation made from gossamer thin purple fabric. Interesting! He was tall but stocky, wearing black: leather scull cap, vest, wrist-band, jeans and motorcycle boots. Tattoos adorned his chest and arms. I fumbled my camera open and furtively shot a picture. I returned later to confess that I had snapped him without his knowledge and to ask if I could interview him for ABC's Open’s Portrait of a Stranger project. He agreed! Then I noticed a huge camera and tripod nearby. I had photographed a professional photographer, Blair Stuart. He is also a poet, artist, writer and rider of a Kawasaki bike named ‘Michelle’. While he was helping his partner set up her dress stand, Blair confided that his first tattoo marked the loss of his daughters. All his other tattoos represented significant life experiences. As this softly spoken, complex man revealed just some of his many layers, it occurred to me how many assumptions we make about people, almost subconsciously, before we get to know them. ​What we think about people is not necessarily who they are, and this can be especially true of men. I have been inspired to create a programme dedicated to this subject - "Men - who we think they are - who they are”, for my regular community radio show. The show will feature poetry by Blair and other local male poets, and hopefully provoke more thought about the side to themselves men don’t often show. I am glad to have crossed paths with Blair, and shared a moment that sprang from a furtive photograph. I spied him between the racks of dresses, my attention being caught by his holding of a gossamer-thin purple creation. He was tall but stocky, wearing a black leather vest, scull cap, wrist band, jeans and motorcycle boots. Tattoos adorned his chest and arms. 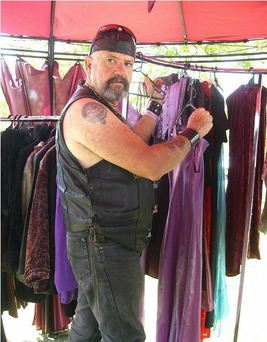 Being secure in his own sexuality he was helping his partner set up her stall, "Loretta's Lawless Lifestyles". He is Blair Stuart of Irish Scottish descent, 60 years old from Queensland's Gold Coast hinterland. Blair is a member of the World Bike Community. Each of his tattoos represents a significant life experience, his first, two hearts side-by-side, marking the loss of his two daughters. Through his chest hairs one can read a quotation from The Prophet by Kahlil Gibran "Love knows not it's own depth until the hour of separation." Blair started his working life as a photographer, was involved with film at Village Roadshow and for many years filled a Managerial position in the Prison Service. He now works part-time for Bunnings!! I read the first four lines of the poem he had written about his girls. Tears filled my eyes. What was I thinking when I said to this stranger, "you're gorgeous." This is a very moving story, and I love how it all sprung from the incongruous sight of Blair holding a delicate dress. It's a fantastic demonstration of what you can uncover when you follow your curiosity and delve a little deeper. The Image is one taken by Loretta L. of me taking my dog Beau on his first Sea voyage in August this year. Hope you enjoy the music that Pauline chose and the words that I and others have shared.